I'm a day late in posting about St. Joseph's zeppole, an Italian dessert that features prominently on March 19, known in the Catholic festival calendar as St. Joseph's Day. The dessert is a large, braided version of fried dough that looks like a donut but tastes more like an Italian cream puff. It is traditionally filled or topped with pastry cream and cherries, though fillings such as ricotta and chocolate cream show up, as well. Photo (cc) by flickr user Finizio. I tried my first St. Joseph's zeppole at Modern Pastry Shop here in Medford recently. 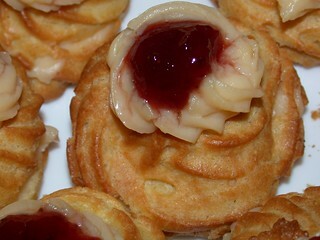 I liked how the tartness of the cherries complemented the sweet pastry cream. I've never loved Italian pastry dough, and this was no exception. The zeppole was soft and almost spongy, and its flavor was a little bland. As far as I'm concerned, if I can get a cannoli (or, rather a cannolo) or a slice of ricotta pie any time of year, I see no need to wait until March for St. Joseph's zeppole. If you like the idea of a soft cherry cream puff, though, find yourself an Italian bakery the next time St. Joseph's Day rolls around.